"The independence that I enjoy to practice medicine the way I want to practice is the most important aspect of my association with ProHealth and Argus." Hospitals, IPAs, Medical Groups or other HealthCare Organizations that want to provide physician practice management services to affiliated physicians. Are you a Medical Group? Are you a Hospital, IPA, ACO, Medical Group or other HealthCare Organization? Are you looking to tie your physicians in through practice management services or a Medical Foundation Model? Argus can provide the following turnkey MSO services.Click here for our MSO Services (full range of physician practice management). Are you a Physician Billing Company? Learn how Argus can enable you with state of the art billing and EMR technology, help you provide value added services to your clients and help you dramatically lower your costs. Click here for our ASP Model for Billing Companies.
" Before I joined Argus, employee staffing and human resource issues were my biggest headache. Now I just let Argus worry about them. It is the best decision I ever made for me and my practice." - Clayton De Jong, M.D. "Our group has been with Argus for nearly two years and we are very happy with the quality and productivity of the billing team. The billing staff is very committed and has highly organized personnel with efficient computer tracking systems to maximize billing collections. They are able to negotiate effectively with payers and remain up-to-date with billing changes and healthcare reform. I would highly recommend Argus to other medical providers." " It has definitely been a pleasure working with Argus. Argus made my life so much easier in running my medical practice. Going from my old billing company to Argus was like going from night to day. Knowing how detailed I was in my work and how specific I needed to be in my billing, I got all my answers in a timely manner. I appreciate the courtesy and patience they have shown me with all my questions. Argus simplified what can be a torture in billing. Again, thank you very much." "I LOVE you guys! I am making at least 25% more on the same volume of business because you are CLEARLY collecting better! I am SO happy with your service!" - Mauricio Heilbron, Jr. M.D. "I cannot thank you enough! You have…literally…saved my company!!! Now we can proceed to profitability. This will allow us to help the millions of folks with (and at risk for) kidney disease and other ailments. I'm glad I came back! Argus has a partner for life with Kidney Care Institute, Inc."
I am a general surgeon in the Orange County area and have been in practice locally for about 8 years. During that time I've utilized numerous billing companies for my medical practices and surgery centers. I've found that the smaller 'mom and pop' models tend to be reliant on one or two members of that company which leads to instability. And, some of the larger 'national' firms tend to try and manage my account remotely. About 2 years ago I was looking for a local, comprehensive option for my billing, EHR and practice management. 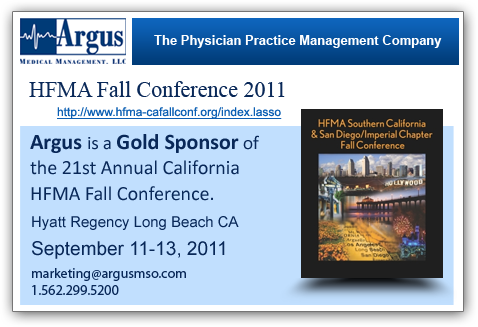 I inquired with the Orange County Medical Association and was referred to Argus. For the past 18 months, Argus has supported my EHR, billing and collections, meaningful use, human resources and my employees, along with my bookkeeping and bill pay. I feel strongly that I'm getting what I pay for and have direct, person-person access to any of the members of my team. This type of service is such a weight off my shoulders and allows me to enjoy the important parts of my practice. I would highly recommend Argus to other physicians in our region. "I have been with Argus for nearly two years and am very happy.They are quick in responding to every single one of my questions.They have a system that I trust and people who are friendly and reliable. They are not the least or most expensive company out there but they are reasonable and worth every one of my hard earned dollars. I do get the sense they are a happy family and I'm proud to say that as a client I feel like part of it. I would recommend them to anyone without any reservation." - Saleem A. Waraich, M.D. "It was such a pleasure to work with everyone at Argus. I had such a great experience and would refer Argus to any medical practice.Thank you for being patient with me as I transitioned from my fellowship training to becoming an independent contractor in a new town! I appreciate your patience and time spent discussing with me and teaching me all there is to know about billing."